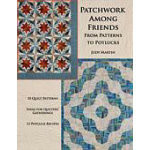 Patchwork Among Friends is, first and foremost, a book of patterns. It includes patterns for 10 never-before-published quilts. Among them are 2 Log Cabin variations, a new Maple Leaf, a rainbow-colored quilt, a Feathered Star, a simplified Lone Star, and 4 other star quilts. Each quilt is presented in queen or king size as well as a smaller size. The patterns range from easy to challenging (but worth the effort). 7 of the quilts sport Judy Martin s signature pieced borders that finish them with a flourish. All are made from scraps and collected fabrics. Whether you plan to make the quilts by yourself or among friends, you will want these patterns. 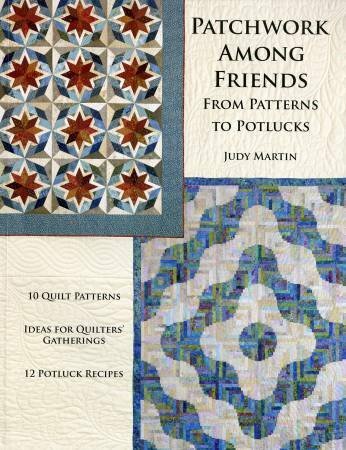 Patchwork Among Friends is also a source of ideas for enjoying your quilt making more among friends. Get together with other quilters to split fat quarters, exchange blocks or strips, collect signatures, or have a party to arrange your Log Cabin blocks. Meet with other quilters working on the same project, either in person or online. Enjoy companionship and share tips and techniques, trials and successes. Even if you sew alone, you ll want to share your glorious results with a reveal party when your quilt is done!